Fusang: 5th Century Pacific Crossing? We know that Columbus wasn't the first non-native to visit the Americas, since we have hard evidence that Vikings under Leif Ericson created an exploration base on the Atlantic shore of Canada around 1000 C.E. "L'Anse aux Meadows," situated on the northernmost tip of Newfoundland, is evidence of the earliest incontrovertible pre-Columbian discovery. Which leaves a host of controvertible discoveries. Over the years, discovery of the Americas has been credited to Egyptians, Phoenicians, Africans, Trojans, Carthaginians, Romans, Arabs, Irish, Welsh, Germans, Poles and at least one of the Ten Lost Tribes of Israel, all of whom are supposed to have crossed the Atlantic Ocean well before 1492. Coming across the Pacific, we have the Buddhist missionary Hui Shen, who, as an old man, visited the Chinese emperor Wu Ti at his court in 499 C.E. 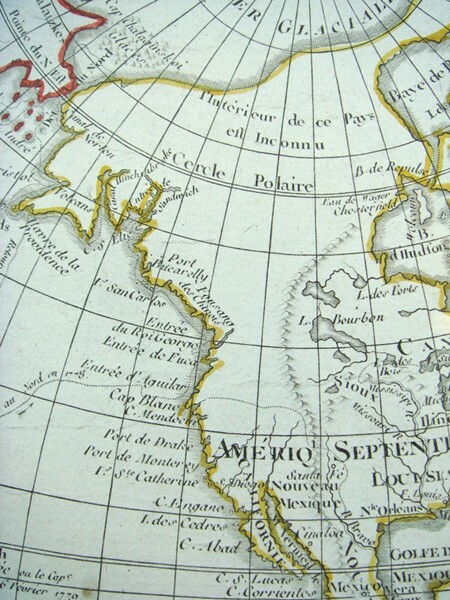 He reported that 40 years earlier he had sailed with four companions to a place named Fusang, located 20,000 li, or 5,000 miles, east of China -- shown in the area of present-day British Columbia on the accompanying French map of 1792 ("Fousang des Chinois"). According to the account preserved in the 7th century Book of Liang, Hui Shen told the emperor, "The native tribes in Fusang were civilized, living in well-organized communities. They produced paper from the bark of the Fusang plants [mulberry? maguey?] for writing and produced cloth from the fibers of the bark, which they used for robes ... A main chief, with the help of several officials, governed the country. The majority of people were law-abiding citizens ... The marriage arrangement was relatively simple. If a boy wanted to marry a girl, he had to build a cabin next to the home of the girl and stay there for a year. If the girl liked him they would get married; otherwise he would be asked to go away ..."
• We know that Chinese shipwrights were building ocean-going junks as early as the second century. • To prove that a trans-Pacific voyage was possible, five young Chinese men sailed a junk from Taiwan to San Francisco in 1955. They came the direct way across the open ocean. If you follow the coastline, the longest stretch of open sea between China and North America is only 200 miles, between the Komandorskies and the Aleutians. • The Maya people of Central America did write hieroglyphics on bark paper. • In 1882, a miner found 30 Chinese coins 25 feet below the surface near the old asbestos town of Cassiar, north of Dease Lake, British Columbia. According to a contemporary report, "the coins were dated to 1200 B.C." Beyond these slim clues, we really can't say one way or another if Hui Shen -- the "Leif Ericson of China" according to Alexander von Humboldt -- made it to the Americas, the land he called Fusang. What would clinch the tale would be the discovery of a wrecked Chinese junk off our Pacific coast -- marine archeologists, take note! Barry Evans (barryevans9@yahoo.com) is patiently waiting for hard evidence to prove that the Welsh Prince Madoc landed in Alabama's Mobile Bay in 1170.